For years, limited-run items were available to fans only on Steve Jackson Games' Warehouse 23 website or at conventions. 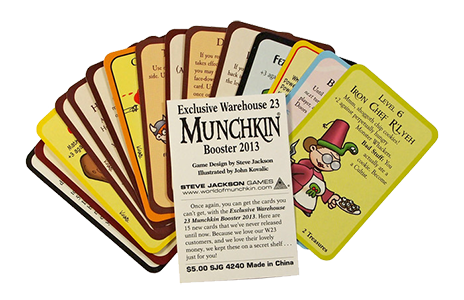 But we have now opened Warehouse 23 so retailers can get these short-run items – including exclusive Munchkin swag – to sell in their stores! Tons of unique Treasures and limited-edition loot is there for the taking. And when retailers order these exclusive items, they will get even more than bargained for: every order comes with a generous amount of promotional material thrown in. That's right! If you would like to get your hands on some Warehouse 23 exclusive items, help out a favorite local game store and get some promos out of the mix! Or, if you're a retailer yourself, check out this site for more information!